Numerous strategies have been experimented with nationwide in an attempt to reduce the overall number of pedestrian-vehicle crashes, especially in instances where improper crossing or failure to yield was the proximate cause of the crash. Some of these measures include overhead signs, flashing warning beacons, advanced crossing signs, more visible pavement markings, in-street ?Yield to Pedestrian? signs, and more recently, in-pavement flashing lights. Pedestrian safety has been a key issue for the City of Cedar Rapids, Iowa, in particular at non-controlled intersections and mid-block crossings. In 2002, the city council gave preliminary approval to implement a pedestrian-actuated overhead flasher system in conjunction with an in-pavement flasher system at the intersection of 1st Avenue NE and 4th Street NE in the downtown central business district. This location is uncontrolled and has several elements that can create conflicts between pedestrians, vehicles, and trains that service local industry. This report summarizes the results from a small-scale study completed by CTRE to evaluate the effectiveness of the in-pavement flasher system installed in downtown Cedar Rapids. The installation of in-pavement flashing warning lights at the pedestrian crosswalk at this site has had a net positive effect on the safety characteristics of the location. The results of this study show a marked improvement in motorist compliance with the state law requiring that motorists yield to pedestrians in the crosswalk. The pedestrian and motorist surveys show that both groups felt the in-pavement flashing lights have increased motorist awareness, especially at night. The data indicate the in-pavement flashing warning lights improved the motorists’ response to pedestrians in the area, and that the system could be operational throughout summer and winter conditions. 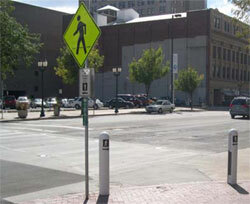 Pedestrians activate the flashers by walking between the white posts or bollards.